Join us for a guided walking tour of some of Chicago’s most popular sites! This tour will be offered on Monday, after the training classes and on Tuesday after the tutorials. Come along with Carlene, Raj and Owen for a stroll around town - through the beautiful city of Chicago. We are delighted that this years' Agile Testing Days USA will be hosted in this vibrant and historic town. So, put on your walking shoes and let's explore some of the most iconic sites of the Windy City together. Network with new AgileTD friends and prepare for a great conference experience. Following the tour, please join us for dinner or continue to explore (meals are not provided)! Come back to the Palmer House and enjoy the Agile Networking Night to meet the rest of the ATD crew on Tuesday night. 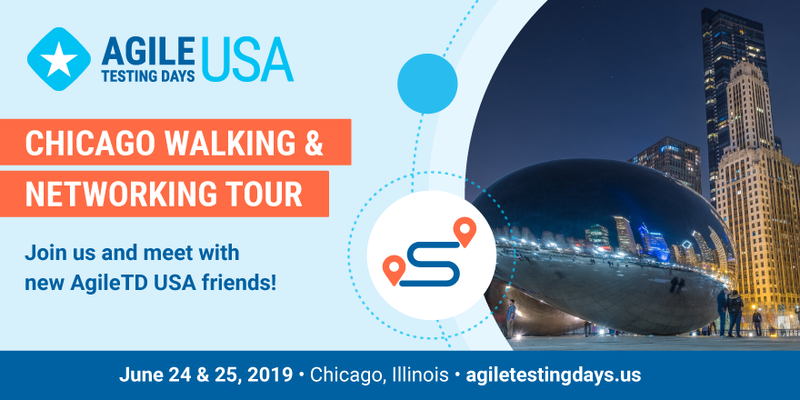 This is free of charge for all Agile Testing Days USA attendees.